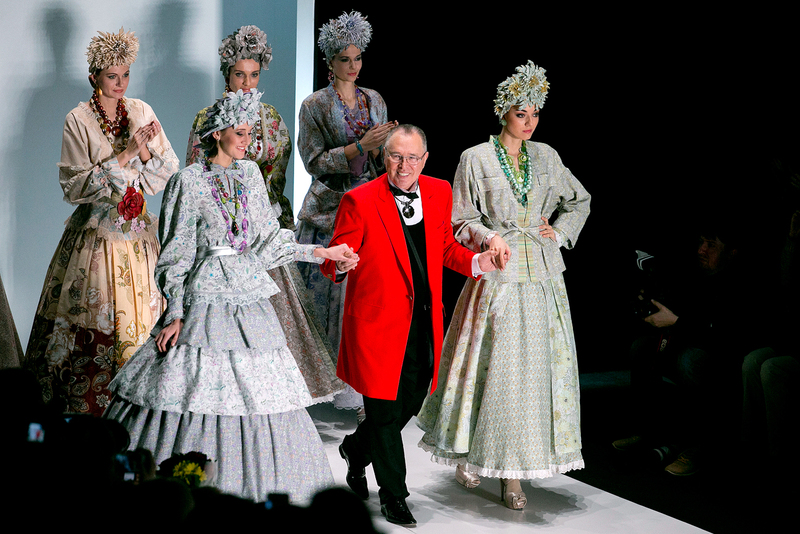 Russian designer Slava Zaitsev walks surrounded by models after a fashion show of his creations at the Russian Fashion Week in Moscow. Mercedes-Benz Fashion Week Russia will be held on Oct. 13 to Oct. 17, 2016 at the Manege Central Exhibition Hall. Over 70 fashion designers from Russia, Georgia, Ukraine and other countries will present their collections. Most of the designers and brands will demonstrate their spring/summer collections, but some will exhibit the current season or mixed collections, following the ‘see now buy now’ trend. The MBFW Russia catwalks will see collections by SLAVA ZAITSEV, Alena Akhmadullina, VIVA VOX, YASYA MINOCHKINA (Ukraine), Yulia Nikolaeva, Dasha Gauser, Julia Dalakian, IGOR GULYAEV, Goga Nikabadze (Georgia), DIMANEU, Saint-Tokyo and others. Mercedes-Benz Fashion Week Russia also supports talented debutants. In the new season for the first time in their careers the following designers will demonstrate their collections on the Manege catwalks: MACH&MACH, Julia Dilua, ANASTASIA KONDAKOVA, ZA_ZA, Anika, NAIDAL, Turbo Yulia, Nikolay LEGENDA, as well as Russian Fashion Council grants awardees Artem Shumov, CHASTO, and Lime Blossom among others. For the first time all the MBFW Russia shows will be broadcasted in the 360° format. An interesting addition to the new season of MBFW Russia will be the Festival of Russian Folk Artistic Crafts – ‘Art Legacy’, which will take place at the Manege Central Exhibition Hall. The Fashion Futurum conference, which was successfully launched in the previous season, will be continued by the Fashion Futurum Startup Show on Oct. 17 at Manege.